Harvests early-mid summer - stores into mid-winter. May be available this year. Carpathian came from the mountains of the same name in Southeast Poland and is sometimes called Polish Carpathian. It is a generally good sized though not a particularly large garlic. Being a Rocambole garlic, its flavor is very strong, hot and spicy and sticks around for a long time. From a growers perspective, it grows well in cold winter areas and usually grows healthy surprisingly uniform sized bulbs. It has thin bulb wrappers that have a lot of purple and brown in them along with some reddish-orange veins. Carpathian usually has anywhere from 8 or 9 easy to peel cloves that are of good size, with no smaller inner cloves. The outer bulb wrappers are thin and flake off easily so it is not a very good storer, but no Rocambole is. 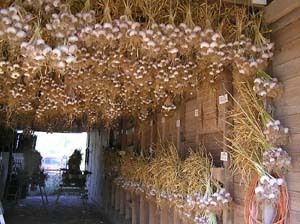 For those up north who want to grow their own garlic it only takes a year or two to grow all you can eat. It harvests in mid-season but a little later than most of the other Rocamboles. Bulbs are usually over 2 1/2 inches in diameter and are of good size are grown primarily for their rich flavor and good pickling capability.